Your Embroidery Business Plan Made Easy! After many years of running my embroidery business, I went to the bank to borrow money for a new embroidery machine and they would not let me borrow any money until I showed them a Business Plan! I had no idea what a business plan was or how to create one! Thankfully, they told me where to go to get some information so that I could get started on one. The Business Plan that I created took many many hours of my time to do all of the research that was required and when you are a one person business owner-operator this is not easy! Trying to run my business by day and work on my plan at night along with trying to run a household was really a huge task! It took several weeks before I was completely finished and to do it was a huge waste of time. There has to be a better way, one that would not take so many hours and yet be just as effective! After meeting with a loan officer in the bank and him telling me that I had to have a Business Plan, I realized that what he was saying was true. I had no idea as to what I was doing and even if I was running my business correctly or not! I was on a daily treadmill and I had no idea about what to do or how to create a plan that could help me reach my goals. I always set many goals but I was never able to reach them and I could not figure out why! Creating my Business Plan was one of the most enlightening exercises that I have ever done! This was like the beginning of truly starting my embroidery business. I finally had a direction that I could move towards and a way to be able to reach my goals. You have no idea as to where to begin. You cannot seem to find the time. You have no idea as to how to create your financial data. Without a plan your business is costing you money and you are running it like a hobby, not a business! Business Plan Made Easy Program! You if you have an apparel decorating business and want to add embroidery. I am going to start at the very beginning of planning for your embroidery business and there may be some of the basics that you have overlooked or did not realize when you started your embroidery business. A good working business plan is the first and most important tool that most embroidery business owners are lacking. Without a plan, you really do not have much of chance for survival! 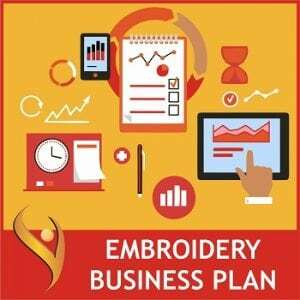 I will show you how to create your Embroidery Business Plan and a Plan for each area within your business! In this workshop you will be guided step by step through each area of the business plan and you will end up with one that you can truly use as your week to week guide in running your embroidery business. As you follow me through this program, YOU will finish with your Business Plan in hand as well as your Marketing Plan. Yes, your Marketing Plan is part of your Business Plan but it is one of the key elements and your Marketing will either make you or break you! This one area we will be working on extensively. I am going to devote one entire lesson on the Marketing Plan. I will also be devoting another lesson on the Financial area of your Business Plan. I will teach you how to create those projections that are so important! Here Are Some Of The Fantastic Benefits You Will Receive After You Have Created And Implemented Your Business Plan With Me! You Will Wake Up Each Morning Knowing Exactly What You Are Doing That Day! Waking up every morning with your plan in front of you is a great way to start your day! Not only does it save you a lot of time, it frees up your mind so that you can think more clearly and you will be accomplishing your tasks at the very best part of the day! When you start your day in this manner, it is so refreshing knowing exactly what you are going to be doing and much easier to get through your day.At the end of the day you feel like you have accomplished much more than you did before you had your Business Plan in place! Reaching Your Goals Is Much Easier And Quicker! Trying to reach a goal when you do not have a plan in place is like shooting in the dark! It is almost impossible. This was my experience every time I set a goal and then I worked very hard to reach my goal but I had so many obstacles in the way. I did not know how to plan for the obstacles!When you have your plan in place you have specific steps that you will take on a daily and weekly basis that will help you work towards those goals even in the face of events that occur to get in your way! It Is Easier To Change Your Course Of Action When Necessary! A Business Plan is not designed to be cut in stone, it is your Guide as to how you are going to run your business and the steps that you are taking. This does not mean that it cannot be changed.We all know that events happen that can completely throw us off guard. Some times these events change our entire course of direction. In today’s economy we have had to make a lot of changes in the way that we run our businesses and do our marketing.With your Business Plan in place, it is easy to make the adjustments that you need in order to make these changes. Even though I plan on a 60 day cycle, I have found that I need to go over my plan at the end of every month and very often I have to make changes because of unexpected occurrences that happened during the month. A Solid Marketing Plan Helps You To Stay On A More Even Ground! We all have ups and downs in our business cycle. This is especially true with the embroidery business. If you have your Marketing Plan in place for the year, yes I said the entire year, you can avoid those lean times. With a Good Marketing Plan you will have your promotions scheduled ahead of time.You will have all of them planned in advance of the lean time so that you will be able to increase your sales instead of just hoping that the sales would come in. All of the retail stores have all of their promotions planned at least 1 year in advance and many of them have their basic plans 2 years in advance with adjustments that can be made when the time comes if necessary. Financial Projects Make It Easier To Plan! When you have all of your Financial Projections, you have a specific monetary goal that you are working towards. You can know at all times if you have enough work in your business to reach these goals. If you do not then you can have a promotion ready to kick in to increase that work. Financial Projections and a Cash Flow Statement are great tools that you will use on a weekly basis to see if you are on target or not. Without these projections it is hard to know. I found myself always hoping that I was going to reach my goal but I did not have anything to measure it with and these tools are extremely valuable. You can see immediately which area of your business is not performing the way that you need it to and you can quickly make your adjustments. 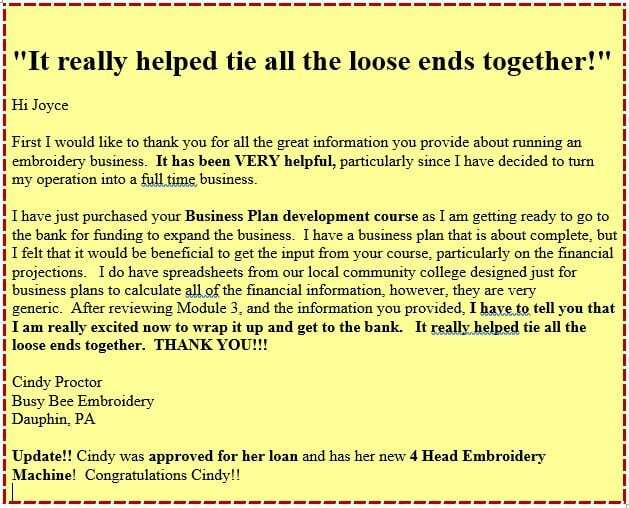 Here Is A Quick Overview Of What You Will Be Learning In The Embroidery Business Plan Made Easy Program! I am going to go over the plan and show you what you need to do for research for your Plan. I teach you the step by step process of creating your plan. This will be your foundation. I will be going into a much deeper level than I have in my book “The Truth About Embroidery Business Success” or in the Embroidery Business Plan Template. It is going to be easier for you to create a plan that will work for you with this step by step process. I will be teaching about Marketing your business and show you how to create your Marketing Plan. I teach you the simple way to create a Marketing Plan for the entire year, Low Cost Marketing methods, how to plan out your entire business in easy steps and how to start Marketing on Facebook. I teach you how to create your Projections, your Sales Forecast, and your Cash Flow Statement. I show you how to compile it all together and create the finishing details to your Embroidery Business Plan. I Have Created The Embroidery Business Plan Made Easy Program Specifically For Embroiderers Like You That Want To Have Control Over Their Business! I want you to be able to have control over your business instead of your business running your life. I know how it feels to lose that control and have your entire business run you instead of you running your business! Once you have your working Embroidery Business Plan you will have the feeling that you are finally in control and you can do the directing instead of that coming from your business! Before I started using my Business Plan I felt like I was so scattered in my thinking and I was continuously running from one project to another. That part of my life is over. It is so refreshing knowing what I am doing each day and I want you to experience that same calming feeling of control. If you are not satisfied with what you are taught in the “How To Create Your Embroidery Plan Made Easy Program” your money will be returned, no questions asked! More Business And Increase Your Profits! So You Must Act Today To Get Your Plan Started! Once you have your Embroidery Business Plan in place you are going to be amazed at the feeling of Freedom you have and how it is going to give you the time to actually run your business in the way that it should be run! It frees up your mind to actually operate your business like a professional and work on new business instead of constantly putting out fires! This $197.00 Investment in my business is one of the most valuable investments I have ever made! Click On The Priority Order Form for the Discounted Price! Get ready to start the Embroidery Business Plan Made Easy Program today before your competitor does! That only makes sense!